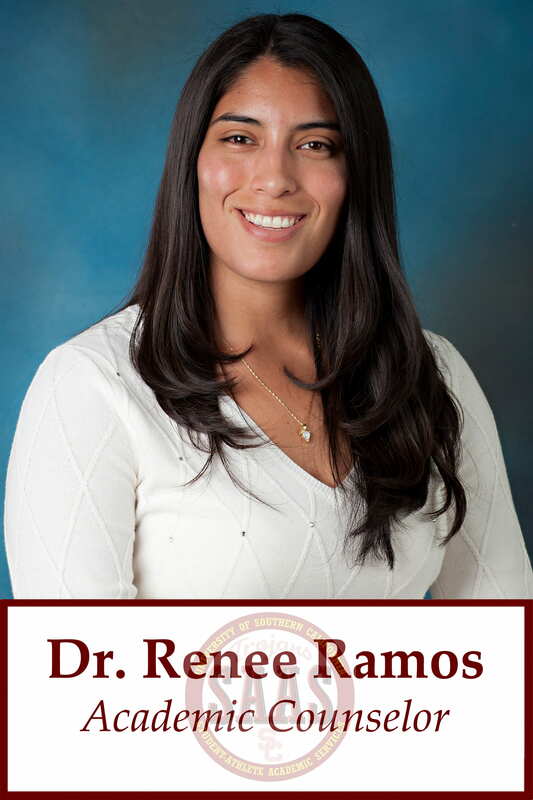 Renee Ramos joined the SAAS staff in August 2014. Previously she worked in student-athlete services at the University of New Mexico as the Football Advising Intern. While at UNM, she worked closely with the football team, monitoring their progress towards a degree, assisting with study skills, academic course planning, and supervising group and individual study sessions. Renee started as a mentor at the University of California, Los Angeles working with Olympic Sports in the Bruins’ Academic and Student Services department. A native of Chino, California, Renee was a four-year letter winner in softball at Boston College, playing second base for the Eagles from 2005-2010 and two-time tri-captain. She earned her bachelor’s degree in Psychology in 2009 and completed a master’s degree in Administrative Studies in 2010. Currently pursuing her doctorate in Educational Leadership at USC Rossier School of Education. Dr. Ramos’s dissertation titled “Latinola College Student-Athletes: Influences on Recruitment, Enrollment, and Degree Completion” is a topic that is understudied, with a clear purpose of promoting social justice in athletics. Despite completing a terminal degree, Renee is earning a second master’s degree in Education Counseling at USC Rossier School of Education. -To have the opportunity to be part of Student-Athlete Services and work with an outstanding staff to learn and grow from, while guiding exceptional student-athletes to academic success. -I love going to the beach, I would like to attempt to learn how to surf and spending time with my family. The USC Student-Athlete Academic Services (SAAS) Program is committed to providing the necessary support to assist all student-athletes in reaching their full potential academically, personally, and professionally. Our program includes academic advising, career development, community service, tutorial programs, and learning specialists, which are all aimed at promoting a philosophy of individual responsibility so as to encourage each student-athlete to value their educational experience.